It’s a bit like a Dexter rom-com with inner monologues and the occasional gruesome scene. This was good. Basically a stalker/killer falling for a girl. Reasonably well paced so it didn't feel like they were dragging out the series. New telly season is upon us. The Walking Dead came back last night (didn't watch it), and Masterchef (didn't watch it). And Top Gear starts again this Sunday (still with Matt Leblanc, seemingly). And we finally started s3 of The Good Place at the weekend and it's still ace. Ive just started season 4 and it is better than ever. I don't think I have ever met anyone else that's watched it but you all should. Lighthearted, funny and very Australian. Orville (The Orville?) on Netflix. Who's seen this? Is it any good? I assumed that as it is named after Keith Harris's duck and stars the bloke behind Family Guy and A Million Ways to Die in the West it is a piss take comedy in the style of Galaxy Quest. Is it? Is it any good? I've not seen enough of it to decide if it's good, but it does somehow manage to be a piss take of earlier era Star Trek while also being quite reverential of the source material. Damien Thorn wrote: And we finally started s3 of The Good Place at the weekend and it's still ace. I noticed this on NF and vaguely remembered someone (turns out to be you) saying it was good. We devoured half a dozen episodes last night, guffawing. I came here ready to angrily complain that nobody had told me about it only to find all the best people had been watching it and right here on this very thread had been telling me about it. span wrote: e.t.a. almost forgot, our new fave is Russian Doll on Netflix - one of the women from OITNB is the star in a sort of groundhog day thing. We're only abotu four episodes in but it's entertaining and is developing quite interestingly. I can't wait to watch this! I posted the trailer the other day and I think it looks really interesting. I've just done four episodes in one sitting. This is brilliant! I love Natasha Lyonne anyway and she's just superb in this. The show looks like some kind of Argento-esque giallo, bathed in lurid nighttime colours and suspicious, askew angles of everyday things. The story is unfolding much more interestingly than I would have guessed and Nadia is a fantastic selfish cow, effing and jeffing her way through her (repeated) day like a whirlwind of cynicism. Tried episode 1 last night and it left me cold annoyingly. Same here. Was expecting great things and found her quite annoying, and didn’t get into it. I've done the other four episodes in one go this morning to finish the series. I loved it. I know she's annoying, she's awful. And she remains awful for almost the entire series, so if you don't like her awfulness then there's no point in you persisting - you'll just hate the rest. Someone else I know noped out of it the very moment Nadia spoke for the first time, he couldn't bear her that much. Anyway, I enjoyed it tremendously much. It becomes bizarrely more confusing as it proceeds and you might expect explanations to be forthcoming, but still held my attention like glue as I was more and more intrigued. I loved Nadia and loved Alan. And loved Russian Doll. Although I really hope there's a second series, there doesn't need to be because it actually ends. Yes that's exactly how I felt about it, Damien. It's one of the best things I've watched in ages. It feels like when I watched Big Little Lies - I think back to when we all watched shows at the same time, one episode a week, and all excitedly discussed twists and revelations - I want to have had that opportunity with this programme. I watched episode 1 and while I liked the premise, just found it a bit meh and unengaging. Left it a few days or so, and read a lot of positive reviews so wondered if I’d missed something. Went back and binged the remaining episodes and really enjoyed it, so maybe that first episode is just not the best introduction? DC Titans. About six eps into S1. Hmm. More engaging and less drawn-out than Marvel stuff, but still suffers from the problem that superheroes are only really interesting when they're doing super stuff. Will I watch more? Maybe. CJ+ wrote: DC Titans. About six eps into S1. Hmm. More engaging and less drawn-out than Marvel stuff, but still suffers from the problem that superheroes are only really interesting when they're doing super stuff. Really? It’s teenage drama with swears. Appalling. It's better than the dirge-fest that was JJ/LC/DD/IF! The umbrella academy, sort of watchmen crossed with league of gentlemen crossed with Fame (or something else sort of reaching with the last one). Intriguing and based on a comic book, on NF. I watched The Brits this week. Did you? No of course you didn't. And I've no idea why I did either, I just heard Jack Whitehall talking about it on the radio and then was home alone in the evening so I watched it. Stop judging. Anyway: it turns out it was simply an exercise in feeling old and irrelevant, as I literally hadn't even heard of half the nominees. Apparently, the band that won best British group are the biggest band in the country right now, The 1975, so-called. No idea. Never heard of them. At the end of the programme, P!nk was given a lifetime achievement award or somesuch. I remember I was already a grown up when P!nk started, when she was young and punky, and now she is a haggard old stateswoman of pop with a back catalogue of at least four million hits. So I watched two-odd hours of telly with a growing sense of baffled Radio 2-ness, idly musing how if you asked me what my favourite bands were, there would all be bands I was listening to in 1990. Shitting hell. 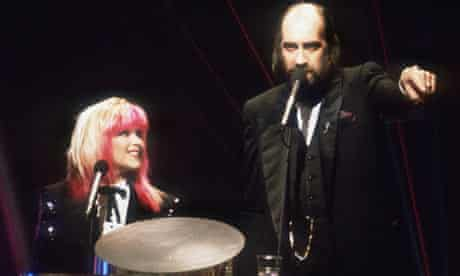 Are Samantha Fox and Mick Fleetwood still hosting it Damo? Damien Thorn wrote: I watched The Brits this week. Did you? No of course you didn't. And I've no idea why I did either, I just heard Jack Whitehall talking about it on the radio and then was home alone in the evening so I watched it. Stop judging. Anyway: it turns out it was simply an exercise in feeling old and irrelevant, as I literally hadn't even heard of half the nominees. Apparently, the band that won best British group are the biggest band in the country right now, The 1975, so-called. No idea. Never heard of them. It's called getting old and not realising it. Forinst, I was chatting with my Saturday staff and made a reference to Charlie's Angels. I said "I don't mean the original 1970's series but the film that was done in 2000, you must have seen that?" "we were all born in 2001"
My daughter’s band are doing a cover of a Marshmello track. Who? I googled him/her/them and it turns out to be a bloke that wears this. He recently did a gig within the Fortnite game. People stopped shooting each other and went to see the concert in the actual game. 11 million of them. Talking to the blokes I do pub quizzes with the other night and they were incredulous that I remember ha’pennies and pound notes. They don’t even remember big 50p coins. I'm also old which is possibly why I’m currently enjoying the new series of Endeavour, the last episode was particularly good and makes me sad that there are only four of them this year. Quality over quantity I suppose. At the weekend I watched The Grand Tour for the first time, essentially because my son wanted to and I like the chance to watch things with him. Of course I expected it to be terrible, because Top Gear had become fatuous and unbearable at the last knockings of the Clarkson tenure. But I really enjoyed it. It was very stupid at times, but not cringingly so - at least not yet. I finished watching series three of True Detective and enjoyed it. Much better than series two but still not quite as good as the first series. Meshugalah Ali and Steven Dorff were good in the main roles and although it was told in three time periods it wasn’t impossible to follow. Damien Thorn wrote: At the weekend I watched The Grand Tour for the first time, essentially because my son wanted to and I like the chance to watch things with him. Of course I expected it to be terrible, because Top Gear had become fatuous and unbearable at the last knockings of the Clarkson tenure. What’s series? Some of the episodes in this latest series have been cringeworthy and appalling. The very first couple of episodes, ever. This sounds like it's right up some of your strasses.